This folio is from the earliest known illustrated manuscript of the Bhagavata Purana, a popular text of 18 000 verses composed around the year 900. The verses speak about the Hindu deity Vishnu, in particular, his form as the god Krishna. 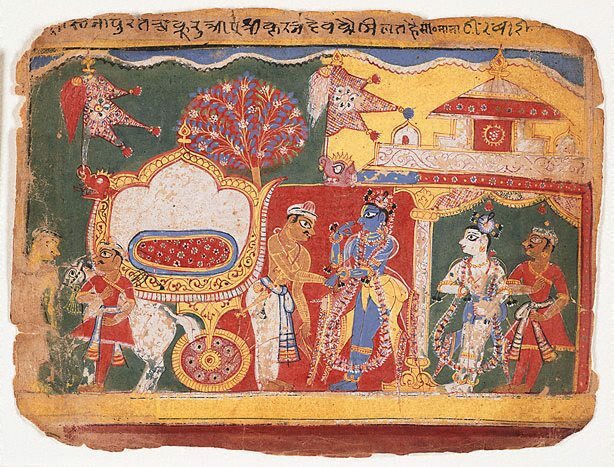 This illustration relates to events in Book 10 when Akura, having returned from Hastinapura, meets with the blue-skinned Krishna and his companions Balarama and Uddhava. Paintings from this manuscript exemplify the 16th-century Chaurapanchasika style, which is characterised by bold primary colours applied in clearly bound sections, rich patterns contrasting with flat, unpatterned areas, and figures in strict profile enlivened by exaggerated gestures and crisp, sharply pointed drapery. Yvonne Tan, Asian Art Newspaper , 'Intimate Encounters, Indian Paintings from Australian Collections', London, Apr 2008, 13 (illus.). Analiese Treacy and Carolyn Murphy, 2008 AICCM Book, Paper and Photographic Materials Symposium , ‘Indian miniature paintings and their margins', unpaginated., Australia, 2008, (illus.). An analysis and reconstruction of the dispersed Bhagavata Purana from the Caurapancasika group , Chicago, 1984, 211, 355 (illus.). Look , Sydney, Feb 2008, cover (colour illus. ); 9 (colour illus. ).